The OAS Report product provides the Report Designer for easily creating reports from data logged with OAS Data Log or OAS Alarm .NET. These reports are then executed from selectable execution types such as event driven from a Tag, continuous as a specified frequency, hourly, daily, weekly, or monthly. 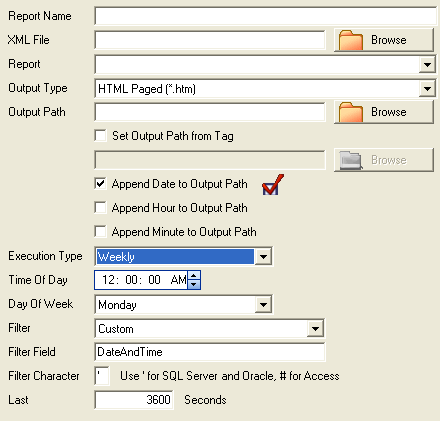 Filter constraints can be added for filtering data to previous hour, current hour, previous day, current day, previous week, current week, previous month, current month, or custom time frame. You can also use an Open Automation Software Tag value with a string data type as a dynamic query string to filter based on any live data values. Reports can then generate files for HTML web pages, Acrobat Reader PDF files, Microsoft Word RTF files, Graphic TIF files, text files, or even directly to the default system printer. Refer to the Report Designer application help on how to create a report. Refer to the Videos – Reports Section for a walk through of the Report Designer and setup of sample report. The Report Designer can import Crystal Reports, and Microsoft Access Reports, and has an easy to use editor and wizards for creating reports in just a few minutes. Use the Calculated Fields like Avg, Min, or Max for performing statistics on the data. To open a new window for assigning Report execution methods, select Configure-Reports or Alt-C-R.
To add a Report to the Service enter a unique Report Name and specify all other parameters as desired, they can be modified later. Use the Add Report button on the Menu Bar or the Add Button at the bottom of the window. Right click on the Report and select Delete. Use the Delete key on the Keyboard. To modify an existing Report simply select the desired Report and make the modifications in the window followed by Apply Changes in the lower right corner. The name that identifies the Report in the Report configuration. This name appears in System Alarms if there is a failure with the Report. All reports groups can be exported to a CSV file by right clicking on the Local service and select Export CSV. Note: You cannot have Excel open with the CSV file during the import as Excel will lock the file for exclusive use. First close the file in Excel, and then proceed with the import. Use the Query String property or Set Query String with Tag to filter data based on your own criteria. You can use the Report Viewer application to manually view and create reports. This is found under the program group Open Automation Software. Use the OPC Systems component in your Visual Studio application to programmatically modify report groups. Refer to the FormConfigureReports Form in the WinForm Example Code example for an example and how to add and modify reports groups. Refer to the Programmatic Access Reports section in the Programmatic Interface – .NET Programmatic Configuration topic for all of the method syntax.